Andi, Sue, Grace and Jarrah discuss Romulan women, from the Romulan Commander in the Original Series episode “The Enterprise Incident” through Toreth and Sela in TNG and Senator Cretak in DS9 to Donatra and Tal’Aura in Star Trek: Nemesis. 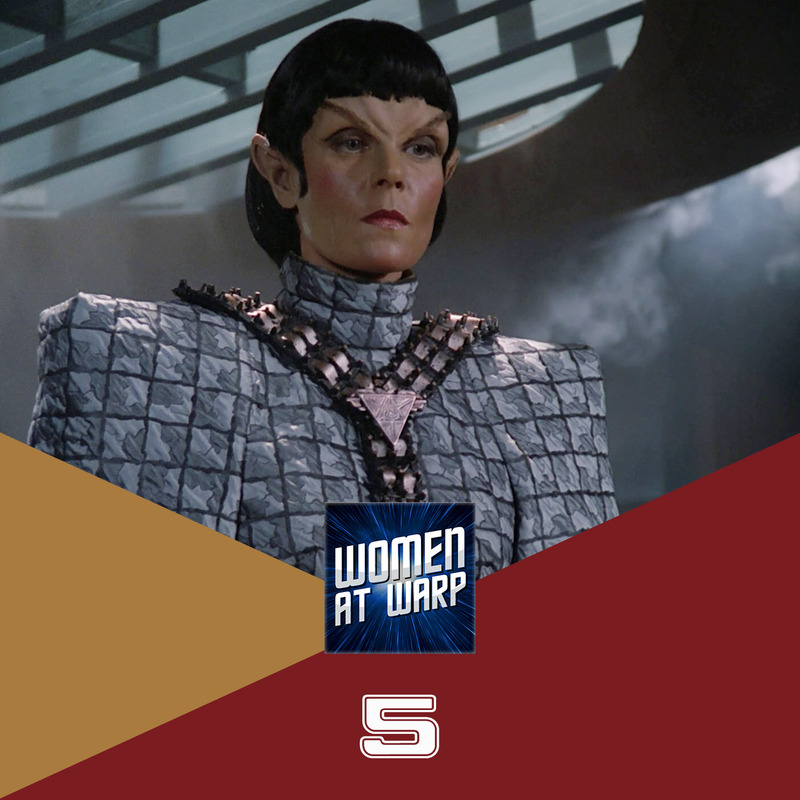 What was it about the Romulans that let us have so many interesting and badass women characters? I wonder if the listener who found all male Romulans boring has seen ‘Balance of Terror’ – with that one exception, I would tend to agree that the women are far more interesting. Carolyn Seymour, of course, also played Abby Grant, one of the great female characters in TV SF, in the first series of Survivors (1975). when the script for “Face of the Enemy” was being made, it was suggested that they bring back Joanne Linville’s romulan commander character from TOS, and early versions of the script apparently used this, but the actress wasn’t available so they invented the character of Toreth to be the commander. i think it would have been interesting if they’d been able to get her for the part. best novel for Commander Charvanek? Vulcan’s Heart. she gets to be one of the main characters, and she really made the book work. plus the book was written as a sort of bridge between TOS and TNG as far as the romulan culture goes. not about her (although some characters are related to her) is the Rihannsu series by Diane Duane. while not fitting into mainstream trek (her earlier trek books which tie in were written before much of the setting was established in detail, so her books are now a sort of ‘alternate reality’ from the show), the rihannsu series has very strong romulan characters (especially the main female commander) , and you get to see a very interesting look at romulan society in the TOS/TMP era. if that’s not enough from a feminist prospective, we also get large appearances by Saavik, Captain Garret, along with cameo appearances by both Uhura and Bevery Crusher( still Beverly Howard then, but soon to be Crusher) In fact, the number of named female characters comes close to equaling the number of named male characters, as to where it is on the timeline, we get the ENTIRE battle of Narendra III, from the shadowy buildup, the entire battle itself from a number of POVs, and the aftermath. This book also manages to accomplish the impossible: give Tasha Yar some small sliver of agency back. When we leave her, we leave her planning an Elizabeth Smart, and she is aware of where she is, what her situation is, and how she plans to turn it to her advantage. Just popped in here to say that we do learn that the Romulans kill children with birth defects when Geordi LaForge and Bokrah, I think his name was, are stranded together on some moon or planet, and Bokrah is astonished that Geordi, as a blind man, has risen so far in society and Starfleet’s ranks.